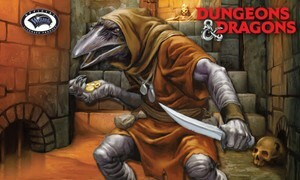 Rich with remarkably humanoid-birdlike-ragged squawks performed by the wonderful Matt Warren of Wizards of the Coast, the "Kenku battle" SoundSet brings to life these most excellent, pesky, and bothersome creatures. This SoundSet is a perfect example of how audio can really bring an encounter to life. Limited to just combat stats, there's not actually much that makes this 'monster' unique, but when you turn on the audio, an encounter with a group of Kenku becomes something players will find truly memorable. There's nothing quite like those persistent squawking voices to make one want to put a sword in something! Kenku are feathered humanoids that wander the world as vagabonds, driven by greed. They can perfectly imitate any sound they hear. This SoundSet was imagined, compiled, designed, created, mixed and finished by Benjamin Loomes of www.syrinscape.com, using samples created by them.